With the discovery of gold and the conclusion of the Mexican-American War, the Mexicans’ bucolic rancho life came to an end. After the Gold Rush, a non-Indian California population of 14,000 swelled to several hundred thousand by 1852. These new Californians needed food, so cattle, sheep and vegetables had ready markets. The price of beeves soon reached $500 at Sacramento and, by 1851; cattle were still bringing from $50 to $150 each. An estimated 3,000,000 cattle roamed the hills and valleys by the early 1860s. Sheep herds grew to over one million in the same period. Prices in the early 1850s included $1 per apple and cherries a dollar dozen. Large cattle herds from the lower Mississippi valley and southwest were driven overland to meet the demand for beef. Albert Stone, who eventually settled in Alamo, was one of those drove cattle to California when he came for a second time in 1853. These cattle gradually altered the breed which was a significant change, since the rancheros had seen no need to actively improve the abundant stock. The new breeds were usually “British” beef breeds: Hereford, Angus and Shorthorn. 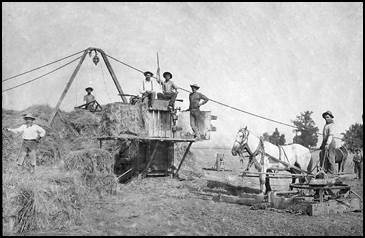 The first pioneers from the gold mines settled in the San Ramon Valley’s open country. Early writers recorded seeing numbers of wild cattle and grizzly bears. The settlers grazed animals and began to plant crops for sale, particularly wheat. Jose Maria Amador and Roberto Livermore had planted a wheat crop in 1837, but such large crops were rare for Mexican rancheros who usually planted grains and vegetables strictly for domestic use. Valley ranchers grazed livestock and farmed, choosing crops which would sell successfully. They often planted crops on the valley floor and put grain and livestock on the hills. A three-year crop rotation between grain, hay and pasture became the practice. Crops including barley, wheat, hay were initially profitable, followed by fruit orchards, beets, grapes, and tomatoes; in the twentieth century, groves of walnut trees and pear orchards dominated the valley floor with cattle and sheep on the hills. Cattle raising was a primary part of valley agriculture for some ranchers during the 20th century. Frank Macedo Sr. and Jr. owned and leased land at Mt. Diablo’s foothills in both Alamo and Walnut Creek. The Blackhawk Ranch grew to 6500 acres and grazed at least 1000 cattle. Wood Ranch raised both cattle and sheep. 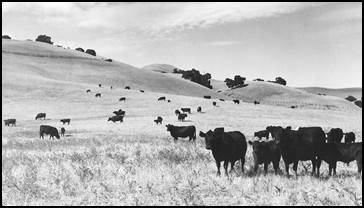 Dougherty Valley’s 10,000 acres were primarily cattle country with some hay and grains. The Wiedemanns eventually raised cattle on owned and leased of 8000 acres. And the Elworthys grazed cattle on several ranches with their home place in Danville. Illustrations of Contra Costa Co., California with Historical Sketches, Oakland: Smith and Elliott, 1879. Rolle, Andrew F, California, A History, New York: Thomas Y. Crowell Co., 1963. Rutherford, Richard, “The $$$ Trend, Red and Black, A History of Agriculture in the San Ramon Valley,” The Valley Pioneer Centennial Edition, 9-4-1958.